The Pacific sardine (Sardinops sagax caerulea) is a small pelagic fish found throughout the Pacific Ocean. In California, the Pacific sardine fishery has historically been one of the largest commercial fisheries in the state. The fishery began in the early 1900s, peaked in the late 1930s, and then declined rapidly in the 1940s during a well-known population downturn fueled by oceanic regime changes and fishing pressure. A moratorium was placed on the Pacific sardine fishery from 1967 to 1986. Then, beginning in the 1990s, Pacific sardine landings increased as the population recovered. 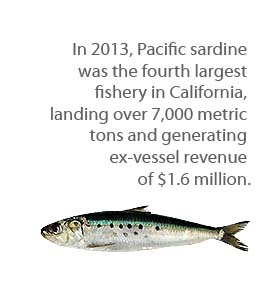 Today, the Pacific sardine fishery continues to contribute to California’s economy. In 2013, the fishery for Pacific sardine was the fourth largest commercial fishery in the state of California by volume. These landings were valued at over $1.5 million dollars. Since 2000, the commercial fishery off California, Oregon, and Washington has been managed by the Pacific Fishery Management Council under the Coastal Pelagic Species Fishery Management Plan. The commercial fishing season for Pacific sardine runs from July 1 through June 30 of the following year. The season is split up into three periods: July 1 – September 14, September 15 – December 31, and January 1 – June 30, each with an assigned harvest limit. Based on 2014 landings information to date from the second period (September 15- December 31), the preliminary harvest amount for the third period (January 1 – June 30, 2015) will be 5,084 metric tons. For more information about coastwide Pacific sardine landings, please visit the NOAA Fisheries Pacific sardine landings web page. For more information about Pacific sardine history, research, and management, please visit CDFW’s Pacific sardine web page. Recently the Pacific Fishery Management Council voted to change the sardine harvest control rule, increasing the upper limit of the sardine harvest fraction from 15 percent to 20 percent. The decision came after an exhaustive set of scientific workshops and analysis involving more than 60 people, held over the past two years to respond to a research paper that suggested that sea surface temperature (SST) measured at Scripps Pier in Southern California, which had been employed as a proxy for sardine recruitment, was no longer correlated with recruitment success. But apparently this fact was lost on environmental activists who cried foul to the media, claiming that sardines are crashing, and the management response to the crisis is to just fish harder. We know that California’s sardine population is strongly influenced by ocean temperatures: warmer waters tend to increase sardine productivity, while colder waters tend to decrease it. 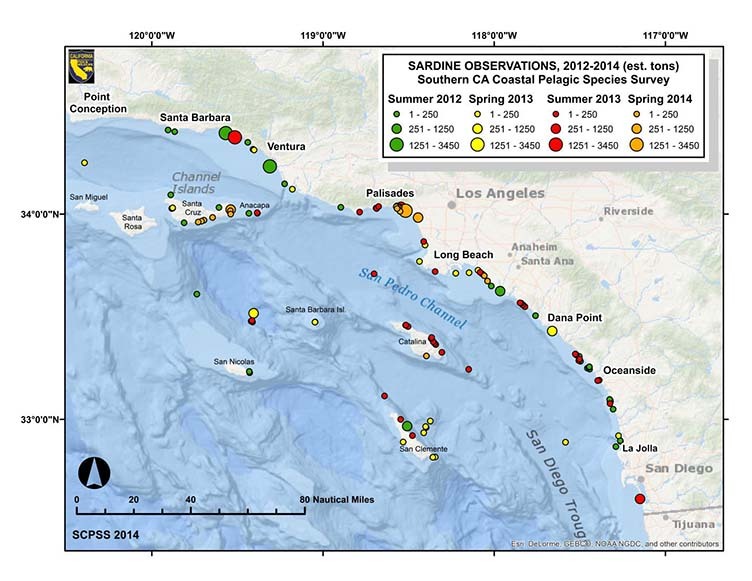 The original sardine analysis, made in 1998, was updated by a new analysis that found offshore sea temperatures slightly better correlated with sardine productivity than the measurements made at Scripps Pier. Population simulations made with the updated information that included the population increase in recent decades show that the sardine stock is about 50 percent more productive than thought in 1998. The management team therefore recommended raising the upper bound of fishing fraction from 15 percent to 20 percent to account for the new best available science. But that doesn’t mean that the catch quota for the coming year will be raised. This is a long-term harvest control rule that simply follows better scientific modeling efforts. The new rules will determine fishing rate just as before: If the temperature is cold, the harvest will be kept low; if the population size decreases, both the harvest rate and the allowable catch will automatically decrease. In fact, the new sardine harvest rule is actually more precautionary than the original rule it is replacing. It does this by producing an average long-term population size at 75 percent of the unfished size, leaving even more fish in the water, vs. 67 percent in the original rule. The original harvest rule reduced the minimum harvest rate to 5 percent during cold periods. The present, very complicated rule, has a minimum rate of 0 percent during cold periods. What’s more, the harvest fraction will only be applied after subtracting 150,000 mt from the sardine biomass estimated in the next year’s stock assessment. Bottom line: The California sardine may be the best-managed fishery of its type in the world — the poster fish for effective ecosystem-based management. NOAA strives to adopt an ecosystem-based approach throughout its broad ocean and coastal stewardship, science, and service programs. The goal of ecosystem-based management is to maintain ecosystems in a healthy, productive, and resilient condition so they can provide the services humans want and need. NOAA Fisheries refers to the ecosystem-based approach to management that is focused on the fisheries sector as ecosystem-based fisheries management (EBFM). While EBFM is directed towards fisheries management, a similar approach, accounting for ecosystem interactions and considerations, can be applied in the management of protected and other trust marine species. EBFM is a new way of looking at the management of living marine resources. The traditional management strategy for fisheries and other living marine resources is to focus on one species in isolation. For example, if a particular species’ population was declining, fishery managers might decide to reduce the annual catch limit the following year in an attempt to reduce overexploitation. However, fishing is only one variable that affects a species’ population. Additional elements come in to play, such as interactions with other species, the effects of environmental changes, or pollution and other stresses on habitat and water quality. To more effectively assess the health of any given fishery and to determine the best way to maintain it, fishery managers should take ecosystem considerations into account. Since August 2012, CDFW’s Coastal Pelagic Species (CPS) Project and the California Wetfish Producers Association have been working together to develop a nearshore aerial survey program for southern California waters. The valuable data collected by the program may be used to set sustainable harvest limits and prevent overfishing of CPS, including Pacific sardine, Pacific mackerel, and northern anchovy. A primary focus of the program is developing scientifically rigorous aerial survey methods. Over the first four field seasons, Pacific sardine schools were mostly observed close to shore along either mainland or island coasts. Boat-based groundtruthing confirmed the accuracy of aerial fish identification, and provided critical biological and environmental data. Starting in summer 2013, other CPS were quantified including northern anchovy and Pacific mackerel. Both aerial and boat survey methods have been refined to improve data collection efficiency and accuracy, and staff have begun integrating all CPS observations into the program. Information from the aerial surveys will help to increase our understanding of the abundance and distribution of CPS in southern California. CDFW coordinates with NOAA Fisheries and other West Coast agencies through the Pacific Fishery Management Council (PFMC) to manage Pacific sardine and other CPS fisheries included in the federal CPS Fishery Management Plan. PFMC uses stock assessments to set sustainable harvest limits that prevent overfishing of CPS populations. Once enough data are collected, CDFW will request that the PFMC include the California aerial survey data in future stock assessments of Pacific sardine and, potentially, other CPS. 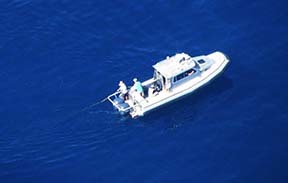 California aerial surveys would complement other types of surveys currently included in stock assessments, such as the ship-based acoustic surveys and fish egg surveys conducted farther off shore. For more information about Pacific sardine research and management, please visit CDFW’s Pacific sardine webpage. The arrival of fall can mean only one thing: Seafood. Yes, while we at NOAA Fisheries appreciate the changing of the leaves and cooler temperatures that signify the change in seasons, for us fall is a celebration of seafood. October is National Seafood Month and a chance for the “seafoodie” in each of us to rejoice. Nationwide, restaurants and markets showcase new seafood choices on their menus that are healthy and flavorful, and that highlight the sustainability of U.S. fisheries from Alaska to the Gulf of Mexico. We know a little something about sustainably caught and farmed seafood, the jobs supported, and enjoyment experienced. Our science-based management process is delivering results benefiting both the environment and the economy. Of course, this wouldn’t be possible without the contributions and commitment of our partners and stakeholders who have helped make the U.S. a world leader in the successful stewardship of marine resources. Seafood has become a powerful ambassador for global ocean stewardship—effectively connecting the wellbeing of human populations to the health and productivity of our ocean resources; and, more importantly, our collective responsibility for their stewardship. Throughout National Seafood Month, NOAA Fisheries will feature stories and updates underscoring the successes and challenges of sustainable fisheries and the seafood they provide. We’ll also highlight the collaborative efforts of the commercial fishing, seafood and aquaculture industries, recreational and subsistence anglers, and conservation communities that will help us move forward and build on our successes. So we invite you to explore seafood this month, knowing that you and NOAA Fisheries have helped make that enjoyment possible. Despite gloomy predictions of El Niño and the broader impact of climate change on the ocean and planet, California’s historic wetfish fisheries carry on – still the foundation of California’s fishing economy. This was the modest beginning of California’s “wetfish” industry. The immigrant Asian, Italian, Slavic and other nationalities of fishermen who came to America introduced new fishing methods. It was the plentiful schools of fish – especially sardines that stretch from the Gulf of California to Alaska – that provided opportunity for generations of enterprising fishing families to prosper. The complex of fisheries that make up California’s wetfish industry, including mackerel and anchovy as well as squid and sardines, helped to build the ports of Monterey and San Pedro, as well as San Diego and San Francisco. Wetfish, now called coastal pelagic species, or CPS, have contributed the lion’s share of California’s commercial catch since before the turn of the 20th century. Even back then, fishermen recognized that a sustainable fishery was good for both fisherman and fish. That’s why over the decades, fishing interests have supported marine protections based on sound science, and have contributed significantly to cooperative research. That tradition continues today. In fact, today, coastal pelagic fisheries in California like squid and sardines are managed with strict quotas as well as numerous time and area closures, including a statewide network of no-take marine reserves. Fishermen are allowed to harvest only a small percentage of the overall fish population. Current regulations require that at least 75 percent of CPS finfish must stay in the ocean to ensure a resilient core biomass, and the sardine protection rate is even higher at about 90 percent. What’s more, to preserve the quality of the catch, fishermen typically fish day trips nearby the ports. This makes California’s CPS fisheries among the most efficient and “greenest” fisheries on the planet with one of the lowest carbon footprints in the world. For example, wetfish fisheries can produce 2,000 pounds of protein for only six gallons of diesel fuel. Beyond the history, the culture and the sustainability, California’s CPS fisheries contribute essential revenue into local port communities. Wetfish fisheries are an important part of California’s fishing economy and squid is California’s most valuable fishery. Statewide, these fisheries represent more than 80 percent of all landings and close to 40 percent of dockside value of all fisheries in the Golden State. On July 11 the Los Angeles Times carried an opinion editorial “The long journey of local seafood to your plate”, by author Paul Greenberg, who made a pitch for local seafood while lamenting the volume exported overseas. Seafood News picked up the story, but with a twist. Indeed, Greenberg could have dodged some critical misstatements, particularly about marketing California’s largest catch, market squid, if he had checked local sources, including the California Wetfish Producers Association, which represents the majority of squid processors and fishermen in the Golden State. CWPA submitted the following op ed to the LA Times, to set the record straight. Another glorious Golden State summer is upon us. San Joaquin Valley peaches are at their height and rolling in to farmers markets from Silver Lake to Mar Vista. Alice Waters’ foragers are plucking Napa zucchini blossoms for the chefs at Berkeley’s Chez Panisse. Barbecues in Sonoma are primed for grilling Niman Ranch grass-fed steaks. And California squid are being caught, frozen, sent to China, unfrozen, processed, refrozen and sent back to the United States in giant 50,000-pound shipping containers. That’s right: Every year, 90% of the 230 million pounds of California squid (by far the state’s largest seafood harvest) are sent on a 12,000-mile round-trip journey to processing plants in Asia and then sent back across the Pacific, sometimes to seaside restaurants situated alongside the very vessels that caught the squid in the first place. Even as the locavore movement finds ever more inventive ways to reduce the distance between farm and table, the seafood industry is adding more and more food miles to your fish. And it’s not just squid. Overall a third of what is caught in American waters — about 3 billion pounds of seafood a year — is sold to foreigners. Some of those exports, such as California squid, wild Alaska salmon and tons and tons of Bering Sea pollock, make the round trip to Asia and back into our ports, twice frozen. Why? To begin with, Americans want their seafood recipe-ready, and seafood distributors here don’t want to clean it. It’s messy, it takes time and, of course, it costs money. For many processors, the much lower labor costs in Asia make it less costly to pay for transporting squid to China and back than to clean it here. So are we to let our seafood production infrastructure vanish entirely and watch dumbly as American fish and shellfish slip down the maw of the vast churning seafood machine of Asia? Moreover, do we really want to intermingle our food supply with the apparatus of China, a nation that is cruelly stingy with its labor force and that had such severe problems with food safety in 2007 that it executed the director of its food and drug administration for accepting bribes? And there are finally starting to be opportunities for keeping our seafood here — from net to table. In the last five years, dozens of community-supported fisheries, or CSFs, have been formed along U.S. coasts. Like community-supported agriculture co-ops, CSFs allow consumers to buy a share in the catch at the beginning of the season and receive regular allotments of guaranteed local seafood. CSFs help fishermen enormously by giving them start-up capital before they get out on the water. They also lock in a good price for fish that helps fishermen exit the ruthless price-crunching commodity market. A few CSFs are even taking on squid. Alan Lovewell of Local Catch Monterey Bay CSF is collaborating with Del Mar Seafood of Watsonville to micro-process 1,000 pounds of squid for the Local Catch buying coop. This summer, for the first time, Local Catch members will get fully fresh (instead of double frozen) squid tubes and tentacles that make for fabulous grilling, stir-fries and Italian zuppa di pesce. Yes, they’ll pay more for it. But if all Californians were to do it this way, economies of scale would prevail. It costs processors about $1.50 extra per pound to process squid here in America. Wouldn’t you be willing to pay that kind of premium to keep your squid fresh and out of China? And even if you don’t have access to a CSF, there’s always the option of cleaning the squid yourself. Currently, the 10% of unprocessed squid that doesn’t go to China often gets used as bait. If you ask your fishmonger, you might be able to get some of that whole squid yourself. It’s really not that hard to clean it. And if you mess up the first time around, it’s not a big deal. Squid are actually incredibly cheap compared with most seafood, and it is high in omega-3s and minerals to boot. The next time you fire up the backyard barbecue, consider buying a pound or two of California’s tentacled native seafood, getting out your knife and cutting board and experiencing squid as it’s meant to be eaten: fresh from the ocean and bursting with flavor. In his op-ed to the Los Angeles Times last week, author Paul Greenberg could have dodged some critical misstatements and inaccuracies about the marketing of California squid – the state’s largest catch. All he had to do was check with local sources, including the California Wetfish Producers Association, which represents the majority of squid processors and fishermen in the Golden State and promotes California squid. Instead, Greenberg missed the boat on a number of issues, including the overall carbon footprint of seafood, but equally important, the reasons why most of the squid that California exports is consumed overseas! First, size matters and price rules when it comes to California market squid, which are one of the smallest of more than 300 squid species found worldwide. The U.S. “local” market really prefers larger, “meatier” squid, notwithstanding Greenberg’s ‘locavore’ movement. Greenberg acknowledged the labor cost to produce cleaned squid in California adds at least $1.50 per pound to the end product. In fact, local production costs double the price of cleaned squid, due to both labor (at least $15 per hour with benefits) and super-sized overhead costs, including workers’ comp, electricity, water and myriad other costs of doing business in the Golden State. Del Mar Seafood is one processor in California that micro-processes cleaned squid at the request of markets like the CSA that Greenberg mentioned. In fact, virtually all California squid processors do the same thing at the request of their customers. But at 1,000 pounds per order, we would need 236,000 CSAs, restaurants or retail markets paying $1.50 more per pound to account for the total harvest. If the demand were there, we’d be filling it! Greenberg also misconstrued the issue of food miles. Respected researchers like Dr. Peter Tyedmers, , from Dalhousie University in Canada, found that transport makes a minor contribution to overall greenhouse gas (GHG) emissions, when considering the carbon footprint of seafood (or land-based foods). Mode of production is far more important. Here’s another surprise: California squid is one of the most efficient fisheries in the world – because a limited fleet harvests a lot of squid within a short distance of processing plants. Studies show that the California wetfish fleet, including squid, can produce 2,000 pounds of protein for only 6 gallons of diesel. Squid are then flash frozen to preserve freshness and quality. Keep in mind that even with immaculate handling, fresh squid spoil in a few days. As counterintuitive as it may seem, even with product block-frozen and ocean-shipped to Asia for processing, California’s squid fishery is one of the ‘greenest’ in the world. One recent survey estimated that about 30 percent of California squid is now either processed here or transshipped to Asia for processing (other Asian countries besides China now do the work) and re-imported. China, although important, is only one export market that craves California squid. With a growing middle class billions strong, Chinese consumers can now afford California squid themselves. Many countries that import California squid prefer the smaller size, and California squid goes to Mediterranean countries as well. In short, most of the squid that California’s fishery exports is consumed overseas. Why? The U.S. palate for squid pales in comparison to Asian and European demand. Also important to understand: California squid is the economic driver of California’s wetfish industry – which produces more than 80 percent of the total seafood volume landed in the Golden State. California squid exports also represent close to 70 percent by weight and 44 percent of value of all California seafood exports. Our squid fishery contributes heavily to the Golden State’s fishing economy and also helps to offset a growing seafood trade imbalance. The sad reality is that price really does matter and most California restaurants and retail markets are not willing to pay double for the same – or similar – small squid that they can purchase for half the price. Nonetheless, we do appreciate Greenberg’s pitch for local seafood. Our local industry would be delighted if, as he suggested, all Californians would be willing to pay $1.50 a pound more for California squid. We may be biased, but in our opinion California squid really is the best!